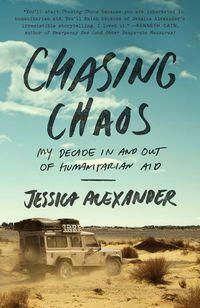 Jessica Alexander began her career as an aid worker with idealistic eyes. But the day-to-day realities of helping rebuild disaster areas made her realize aid work is a profession with its own challenges and pitfalls. She traveled the world, helping people in Darfur, Sierra Leone and Haiti. She chronicles her journey in her memoir, “Chasing Chaos: My Decade In And Out of Humanitarian Aid” (Broadway Books/2013). Host Frank Stasio talks with Jessica Alexander about her new memoir. She will be at Quail Ridge Books in Raleigh tonight at 7:30. McIntyre's Books in Pittsboro tomorrow at 2. Flyleaf Books in Chapel Hill Saturday at 2.